For teenagers, friends and peer groups have a stronger influence on attitudes and behavior than anyone else. Often, this is especially true when it comes to dating relationships. Teens’ peers can have huge influence over their decisions to start dating someone, to use violence or to build healthy relationships, to seek help or not if a dating partner is violent, and to stay in or end a relationship. 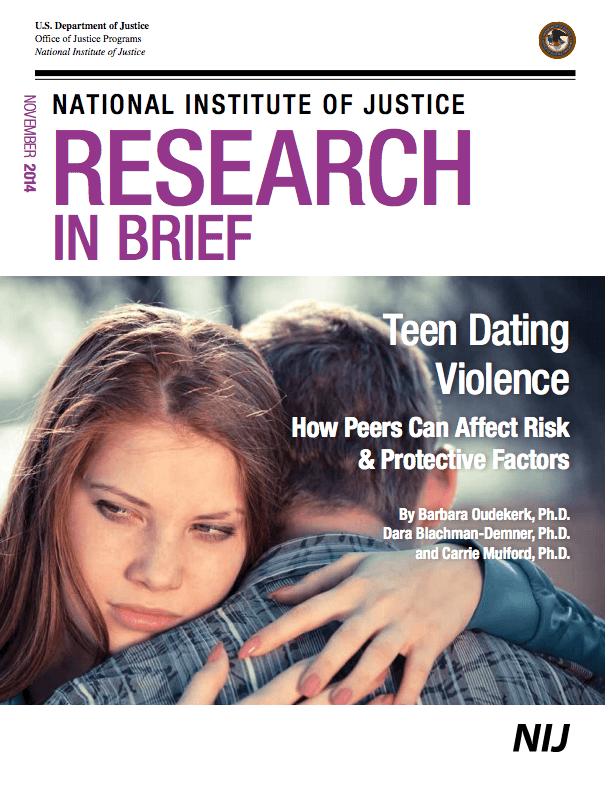 If peers can have such a strong role in behaviors related to teen dating violence (TDV), it makes a lot of sense to target prevention efforts to certain risky peer networks or to use peer networks to reinforce the positive attitude, skill, and behavior changes that many prevention programs aim to make in individuals or in romantic relationships. It’s probably much harder for a teen to justify being violent in their relationship if all of their friends vocally disapprove of violence in romantic relationships and in general. Teen Dating Violence: How peers can affect risk & protective factors is a recent report by the National Institute of Justice. It explores how peer groups influence TDV and how prevention practitioners can work with peer groups to prevent it. In addition to discussing practical considerations for planning prevention efforts that target peer contexts, the report talks about four main points that research has made about why peer contexts are so important for preventing TDV. Having a risky peer context, for example where peers are victims and/or perpetrators of bullying, physical violence, and cyber bullying, increases the risk of victimization and/or perpetration of TDV. Having peers who are delinquent in school or the community is an especially important risk factor for TDV. Teens who experience dating violence often seek help from their peers before anyone else. Peers can help or discourage victims from seeking further help. Programs that have focused on social contexts have had some positive effects for preventing TDV. The building component of Shifting Boundaries shapes peer contexts, and was shown to reduce victimization and increase students’ intentions to intervene in violence. Another program that provided group treatment to girls in the child welfare system reduced TDV victimization. Identifying risky behaviors or risk factors for TDV perpetration among individual students can also identify entire peer networks that might be at especially high risk for TDV perpetration, and thus might benefit from targeted prevention efforts. For example, if there is a high rate of bullying at a school, that school may be at higher risk for TDV. Or, if one or more teens in a certain friend group are delinquent at school, they and their entire friend group may be at higher risk for TDV perpetration. It certainly seems like peer contexts are important for TDV prevention. How have your prevention efforts worked specifically to change social and peer contexts? How can prevention efforts make peer network change a primary goal, and not just a side effect of individual change? Full citation: National Institute of Justice. (2014). 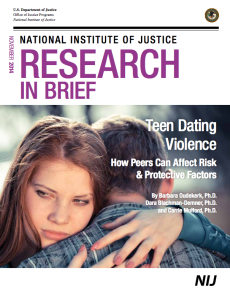 Teen dating violence: How peers can affect risk & protective factors (DOJ Publication no. NCJ 248337). Washington, DC: U.S. Department of Justice Office of Justice Programs.